Mark Grantham has been around Hospital Radio since 1989. He started volunteering at Hospital Radio Chelmsford in Essex and was involved in all manner of programmes and back office functions, including Production, PR, Treasury, Secretary and Chairman of the committee in his 27 years with them. During his tenure with Hospital Radio Chelmsford he was awarded several National Hospital Radio awards both as a presenter and producer and led the station to win the Gold Station of the Year award in 2006. 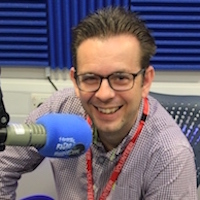 Mark also volunteered at Stoke Mandeville Hospital Radio for 18 months, before arriving at Radio Hillingdon in February 2015. Mark has also spent a little time working in commercial radio and several community radio stations. Every morning, Mark teams up with Colin Moore for Mark and Moore in the Morning at 10am until 1pm Monday to Friday. They love nothing better than having a laugh and joke, whilst playing the brightest sound around.